Tina's Crop Shop: ICS Blog Hop - Girl's Night Out! Hello and welcome to May's Inspire, Create, & Share Blog Hop! If you've already been hopping then you should have landed here from Terri Takashige's fabulous blog! and already know that this month's theme is Girl's Night Out! Girl's Night Out may mean something different to me than it does to you. My version of a night out with my friends is to head over to Starbucks for some coffee, maybe a little shopping and of course always a nice dinner. When I think of my friends, it reminds me that people are so much more important than things. I have some wonderful friends and wouldn't trade them for the world! One of my favorite sets and is unfortunately soon retiring, is "Feel Goods" and I just love the sentiment "the best things in life aren't things"! I started off with an 11" x 4 1/4" piece of Basic Black cardstock that was scored at 5 1/2". I added a piece of the Neutrals Collection Designer Series Paper Stack in Black with white polka dots. I stamped my sentiment in Memento Tuxedo Black Ink onto Whisper White Cardstock. I cut the sentiment out with one of my Circle Framelits and adhered it to my card front with Fast Fuse. I also cut out a Window Sheet with the same size Circle Framelit. I made a frame out of two circle framelits by using a size larger Circle Framelit, and a size smaller framelit (skipping the size I used to cut out my sentiment and window sheet) so that it was a thick enough frame to add some strips of foam tape. The edge of the window sheet was attached to the back of my circle frame with the foam tape The sequins in my shaker card were from the Brights collection with a few random white sequins that I had hanging around my craft room. After laying the sequins onto the sentiment, I attached the shaker frame with the foam tape already on it, onto the area surrounding the sentiment. The Melon Mambo flowers were cut out using the Botanical Builder framelits. I added the small black center and then added a coat of Clear Wink of Stella onto the Petals. For my white flowers, the larger layers were punched with the Pansy Punch, two smaller layers were from the Blossom Bunch Punch, and then a black layer that was back from the Botanical Buiders framelits again. I put a Basic Pearl in the center of each flower. I also used the Botanical Builder Framelits for my leaves that I cut out of Wild Wasabi Cardstock. I used dimensionals to adhere my flowers and used multipurpose glue to adhere the leaves. I added some Black and Melon Mambo baker's twine in two loops around the top of the card and then tied it in a bow on the right hand side to add some balance. Next up on the hop is my friend, and double-up line, Darla Roberts! Just click the next button and you'll be at her blog! 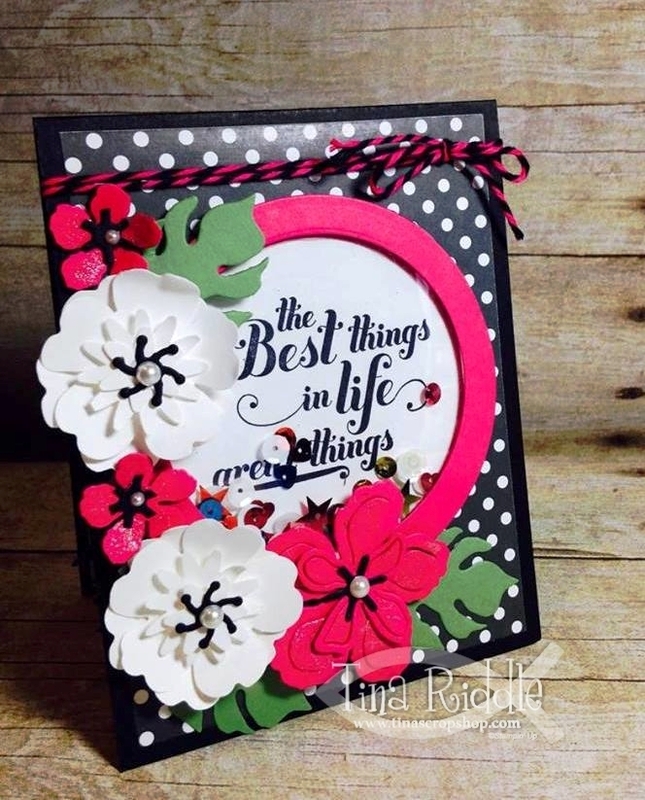 Beautiful card Tina! Love those framelits! Thanks for hopping with us! The colors just pop! Such a pretty card. Very pretty card! Does anyone have a pretty wedding card made they want to share with me? I need to make one for Saturday and just can't seem to get any good ideas. So pretty!! Love the black polka dots! Love these colors! Such a fun card! What a beautiful card! Great colors and love that you made it a shaker card. Those are so fun. I LOVE this card! The layout and color combination are fantastic!!!! Super nice! I love the way u used the colors in this one!!! I love the colors! So fun!